We’ve handled the mold remediation needs for hundreds of homes and businesses across the greater Kansas City metro, on both the Kansas and Missouri side. We have certified staff for mold removal and remediation with credentials from the IICRC (institute for Inspection, Cleaning, and Restoration Certification), and our technicians are up­-to-date and trained in the most current remediation protocols. Where required, we can recommend and/or collaborate with other industry professionals, such as industrial hygienists, engineers, and consultants for protocol preparation and testing both pre and post remediation. Doing so ensures the work we perform is completely insured and the remediation is entirely successful. This protects you, your patrons and employees’ health and safety in the environment they work in. We adhere to all OSHA, CDPHE, EPA, and IICRC standards. Anyone that sets foot on your property will be fully licensed and insured. 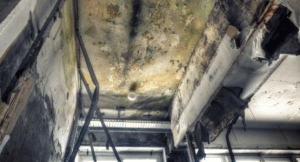 Mold removal and mold remediation is a serious and necessary step to ensuring a mold contaminated structure is safe for its inhabitants. Most people have varying degrees of sensitivity to mold, and in the worst cases, can make some individuals very sick, especially young children, the elderly and those who have weakened immune systems. Your employees and/or your family depend on a safe and clean environment. When you need mold removed safely and professionally, you need ZIPCO. If you have questions or need emergency help, please contact us today via the short form below or by calling our 24/7 emergency number.